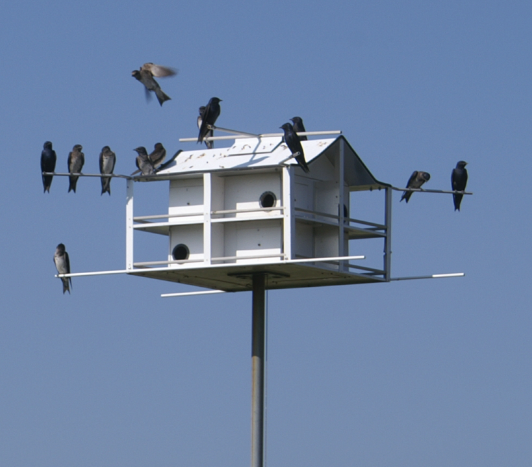 Compartments have side entrances, which the martins like because they turn right or left into large 6''x 11' suite with vinyl coated wire subfloors, removable fronts and ventilation that you can open and close to keep the birds comfortable. Two 48'' smooth fiberglass perch rods with an abundance of of perch space to the bottom porch. Has wide "rain guard" porches to keep the nest dry in extreme weather conditions. Includes a 2" square 14' aluminum pol, ground pole, top perches, winch with stainless steel cable for safe, easy lowering and raising of the martin house. Stop by for more information!